The development of permafrost occurred mainly in the Pleistocene. Although it is difficult to date the formation of permafrost precisely, it is associated with the climatic minimum of the late Pliocene (2.7-2.1 Ma BP). The continental layers in northern Asia dated to this time (the Kutuyakh suite) contain ground veins and ice wedge casts (pseudomorphs). 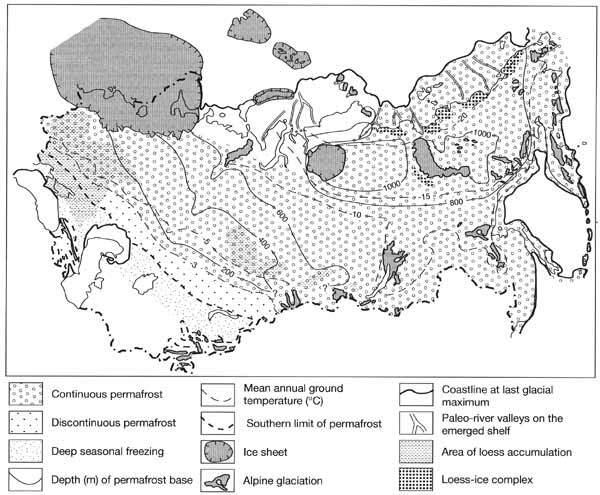 Evidence, pointing at the occurrence of permafrost, has also been found in a younger Olerskaya suite, which is attributed to the Eopleistocene (Baulin and Danilova, 1988). The cryogenic structures in the Olerskaya suite occur as pseudomorphs, which confirms that phases of cryogenesis alternated with those of warmer climate and thawing of frozen ground. Apparently, the climate of the warm stage was similar to the modern climate in the lower course of the Amur, with mean annual temperatures ranging between 4°C and -4°C. There are no signs of permafrost of that age in western and southern regions of Northern Eurasia. The cold phases in the north-east approximately coincided in time with the increasing aridity in the south-west. This asymmetry, which developed only slightly in the Eopleistocene, became more pronounced during the Pleistocene. In the early Pleistocene, for example, ice sheets expanded across the East European plain and Western Siberia while in unglaciated areas only ground veins occurred locally. In contrast, in north-eastern Asia only small valley glaciers formed while permafrost was well developed, as indicated by the ice-wedge horizons in the upper Olerskaya suite. As in the Eopleistocene, cold phases alternated with warmer intervals when permafrost degraded. In central Sakha-Yakutia, there were several waves of freezing and thawing during the early Pleistocene (Baulin and Danilova, 1988). On the East European plain, the cryogenous horizons occur in the middle Pleistocene and younger sediments. Their characteristics clearly show the increasing thickness and low temperature of the permafrost (Velichko, 1973). Data on the middle Pleistocene cryogenic formations have been obtained from detailed studies of loess-soil series on the East European plain. The middle Pleistocene sequence begins with two or three horizons of relatively thin (1-2 m) loess-like sediments broken by small-size fissure polygons and disturbed by solifluction. This indicates seasonal freezing or, probably, sporadic permafrost (Nechaev, 1996). Much more severe conditions are reconstructed from the overlying sediments attributed to the Dnieper ice age. Several horizons of wedge-shaped cryogenic structures, diagnosed as pseudomorphs of polygonal ice veins, suggest that low temperature permafrost existed at that time. Locally, these sediments underlie the till of the maximum glaciation and the characteristic cryogenic structures indicate that ground ice in the western and central areas of the East European plain formed before the development of the ice sheet and remained under ice which was spreading over frozen ground. After the ice sheet retreated, permafrost degraded. The southern limit of the continuous permafrost in the southern East European plain (the Dnieper basin) during the middle Pleistocene glacial maximum reached 49 °N while discontinuous and sporadic permafrost occurred further south. Another cold stage, postdating the maximum expansion of the Dnieper ice sheet, occurred at the end of the middle Pleistocene. As the Moscow ice sheet was retreating, the largest ice wedges, reaching to 3-4 m in depth, formed in western and central regions of the East European plain. Characteristics of the cryogenic horizon suggest that this stage was marked by the most severe environment in the whole of the middle Pleistocene, similar to that of the northern part of the modern permafrost zone, with ground temperatures ranging between -5°C and -7°C (Nechaev, 1996). The first late Pleistocene interglacial was marked by a notable increase in temperature, which was about 2°C higher than at present. This resulted in a considerable reduction in the area occupied by permafrost (Figure 2.5a). The continuous permafrost survived only in the lower course of the Lena and Kolyma, in northern Taymyr and on the Arctic islands (Velichko and Nechaev, 1992). However, even there the ground temperature ranged between -2°C and -3°C, which is 5-7°C higher than today. The discontinuous and sporadic permafrost occupied most of Central Siberia and Sakha-Yakutia. Its southern limit shifted northwards to 60°N. In Western Siberia, permafrost existed northwards of the Arctic Circle and the ground temperature on the continent exceeded -2°C. Isolated massifs of permafrost with relatively high temperatures survived locally in the northeast of the East European plain. The formation of ice wedges ceased practically everywhere while thermokarst processes became active. During the subsequent cold epoch of the late Pleistocene (the Valday-Zyryanka), permafrost expanded (see Figure 2.4). The most comprehensive data have been obtained for the East European plain. 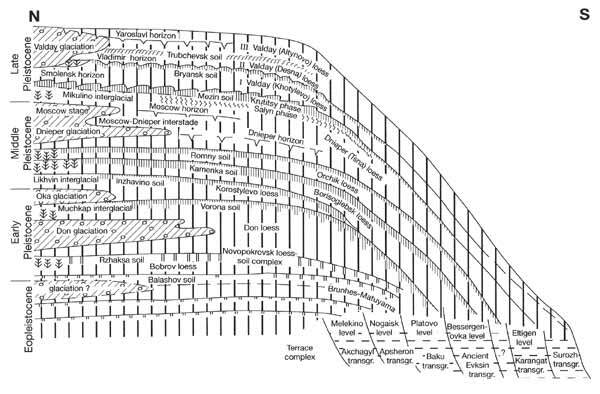 They indicate that there were three main stages in the development of permafrost (Velichko and Nechaev, 1984). The earliest Smolensk stage, which corresponds to the early Valday cooling, was characterized by the development of fissure structures of the earth vein type and small-size ice-earth veins. Permafrost with a temperature of -3°C to -4°C spread to 55-57°N. The next Vladimir stage, dated to the end of the middle Valday interval (the post-Bryansk time), represents a well-pronounced horizon in the loess-soil sequences (Figure 2.1). It was markedly cooler, with the ground temperature reaching -6°C. It is characterized by plastic deformations, indicative of high humidity, and fine crack systems. The third Yaroslavl stage was initiated with the onset of a dryer continental climate during the latest glacial maximum. The ground temperature decreased to about -9°C and permafrost expanded to its maximum extent, reaching 47-48°N. This stage was marked by the widespread occurrence of large polygonal ice veins. Comparison of the cryogenic horizons has revealed a distinct cooling trend and more active cryogenesis at the end of the late Pleistocene, similar to the middle Pleistocene (Dnieper) cold epoch. As for the spatial characteristics of the late Pleistocene permafrost and of its later stages in particular, there was a notable increase in area and thickness of the low temperature frozen ground eastwards along with the reduction in size and thickness of glaciers (Figure 2.4). The degradation of permafrost began in late glacial time. At the boundary of the Pleistocene and the Holocene, its southern limit retreated well beyond 58-60°N. This retreat continued until the Holocene climatic optimum (Figure 2.5 b). In the East European plain, permafrost had thawed by about 6-5.5 Ka BP west of the lower course of the Pechora. In the north-east of the East European plain and in Western Siberia, the ground temperature increased to 3-4°C above modern values. 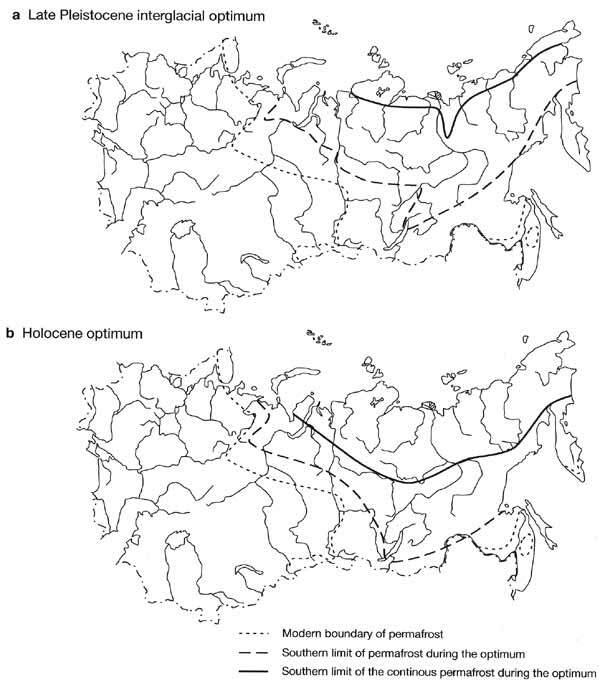 The southern limit of permafrost shifted northwards by 300 km in Western Siberia and by 100-150 km in Central Siberia (Velichko and Nechaev, 1992). Low temperature (up to -7°C) frozen ground survived in north-eastern Asia, although the depth of seasonal thawing increased by a few dozen centimetres. Although most of the East European plain and southern Western Siberia are now free of permafrost, former cryogenic formations, such as polygonal systems of ice-wedge casts, still affect the environment. In particular, they control drainage patterns and the spatial soil pattern (Velichko et al., 1996).